In European folklore and folk-belief of the Medieval and Early Modern periods, familiar spirits (sometimes referred to simply as "familiars" or "animal guides") were believed to be supernatural entities that would assist witches and cunning folk in their practice of magic. According to the records of the time, they would appear in numerous guises, often as an animal, but also at times as a human or humanoid figure, and were described as "clearly defined, three-dimensional… forms, vivid with colour and animated with movement and sound" by those alleging to have come into contact with them, unlike later descriptions of ghosts with their "smoky, undefined form[s]". When they served witches, they were often thought to be malevolent, while when working for cunning folk they were often thought of as benevolent (although there was some ambiguity in both cases). The former were often categorised as demons, while the latter were more commonly thought of and described as fairies. The main purpose of familiars is to serve the witch or young witch, providing protection for them as they come into their new powers. Since the 20th century a number of magical practitioners, including adherents of the Neopagan religion of Wicca, have begun to use the concept of familiars, due to their association with older forms of magic. These contemporary practitioners utilize pets, wildlife or believe that invisible spirit versions of familiars act as magical aids. A story of "a priest who for the space of 40 years employed a familiar spirit", illustrated in Elizabeth I of England's copy of the Histoires Prodigieuses by Pierre Boaistuau. A familiar spirit –(alter ego, doppelgänger, personal demon, personal totem, spirit companion) is the double, the alter-ego, of an individual. It does not look like the individual concerned. Even though it may have an independent life of its own, it remains closely linked to the individual. The familiar spirit can be an animal (animal companion). Among those accused witches and cunning-folk who described their familiar spirits, there were commonly certain unifying features. The historian Emma Wilby noted how the accounts of such familiars were striking for their "ordinariness" and "naturalism", despite the fact that they were dealing with supernatural entities. Familiar spirits were most commonly small animals, such as cats, rats, dogs, ferrets, birds, frogs, toads, and hares. There were also cases of wasps and butterflies, as well as pigs, sheep, and horses. Familiar spirits were usually kept in pots or baskets lined with sheep’s wool and fed a variety of things including, milk, bread, meat, and blood. Familiar spirits usually had names and "were often given down-to-earth, and frequently affectionate, nicknames." 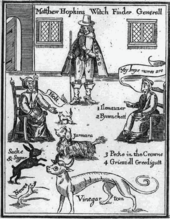 One example of this was Tom Reid, who was the familiar of the cunning-woman and accused witch Bessie Dunlop, while other examples included Grizell and Gridigut, who were the familiars of 17th century Huntingdonshire witch Jane Wallis. An Agathion is a familiar spirit which appears in the shape of a human or an animal, or even within a talisman, bottle or magic ring. It is strongest at midday. In a number of accounts, the cunning person or witch was experiencing difficulty prior to the appearance of the familiar, who offered to aid them. As historian Emma Wilby noted, "their problems… were primarily rooted in the struggle for physical survival—the lack of food or money, bereavement, sickness, loss of livelihood and so on", and the familiar offered them a way out of this by giving them magical powers. In colonial America animal familiars can be seen in the witch hunts that took place in Salem, Massachusetts in 1692. Familiar spirits often appear in the visions of the afflicted girls. Although the 1648 law that defined a witch as one who "hath or consulteth with a familiar spirit" had been suspended ten years earlier, association with a familiar spirit was used in the Salem trials as evidence to convict suspected witches. Sarah Good was said to have a yellow bird who sucked between her fingers. Ann Putnam in particular frequently saw the yellow bird in her afflictions. Tituba was known to have seen strange animals that urged her to hurt children, these included, a hog, a black dog, a red cat, and a black cat. The witch’s mark added a sexual component to the familiar spirit and is often found in trial records as a way to convict a suspected witch. The mark was most commonly an extra teat found somewhere on the body and was suspected to be used to suckle the familiar spirits. An example of this can be seen in the Salem witch trials of 1692. For example, Ann Putnam told Martha Corey that, "ther is a yellow burd a sucking between your fore finger and midel finger I see it"
Recent scholarship on familiars exhibits the depth and respectability absent from earlier demonological approaches. The study of familiars has grown from an academic topic in folkloric journals to a general topic in popular books and journals incorporating anthropology, history and other disciplines. James Sharpe, in The Encyclopedia of Witchcraft: the Western Tradition, states: "Folklorists began their investigations in the 19th Century [and] found that familiars figured prominently in ideas about witchcraft." Margaret Murray delves into variations of the familiar found in witchcraft practices. Many of the sources she employs are trial records and demonological texts from early to modern England. These include the 1556 Essex Witchcraft Trials of the Witches of Hatfield Perevil, the 1582 Trial of the Witches of St. Osyth, and the 1645 Essex Trials with Matthew Hopkins acting as a Witch-finder. In 1921, Murray published The Witch Cult in Western Europe. 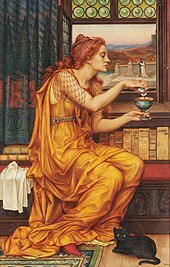 Her information concerning familiars comes from witchcraft trials in Essex in the 16th and 17th centuries. Within this book Murray dedicates an entire chapter to the familiar spirit. Her detailed contribution to the topic included several court cases and accounts from Europe in which she finds mention of familiars. Mary Beth Norton's In the Devils Snare published in 2002, discusses the Salem witchcraft crisis of 1692. She frequently references familiar spirits as she explores the trials of the Salem witches. In Charmed, the Halliwell sisters are gifted a familiar cat. Other witches have also been shown throughout the series with familiars in the form of cats. Familiars are featured in the Netflix series Chilling Adventures of Sabrina. Sabrina’s familiar is a goblin, which takes the form of black stray cat. Fantastic Beasts: The Crimes of Grindelwald features matagots, explained to be spirit familiars. In the manga Sugar Sugar Rune and its anime adaptation of the same name, the two main characters have each a familiar to help them become a Queen. Chocolat has a frog named Duke, and Vanilla has a mouse named Blanca. The Witch features small animals (a goat) as familiars. In a season 11 episode of The X-Files, titled "Familiar", Mulder and Scully encounter a familiar demon which takes the form of creepy children's television show characters. Wikimedia Commons has media related to Familiar spirit. ^ Chauran, Alexandra (2013). Animal Familiars for Beginners. Jupiter Gardens Press. ISBN 1938257669. ^ Willis, Deborah (1995). Malevolent Nurture. New York: Cornell University Press. pp. 32, 52. ^ Bane, Theresa. (2012). Encyclopedia of Demons in World Religions and Cultures. Jefferson: McFarland. p. 21. ISBN 978-0-7864-8894-0. ^ Norton, Mary Beth (2002). In the Devil's Snare: The Salem Witchcraft Crisis of 1692. New York: Vintage Books. pp. 26, 28, 48. ^ Norton, Mary Beth (2002). In the Devil's Snare. New York: Vintage Books. p. 48. ^ Times, The (1916). "Superstition in Essex: A Witch and Her Niggets". Folklore. 27: 3. ^ Murray, Margaret (July 1918). "Witches' Familiars in England". Man. Man, Vol. 18. 18: 101–104. doi:10.2307/2787283. JSTOR 2787283. ^ Murray, Margaret (1921). The Witch-Cult in Western Europe. London: Oxford University Press. pp. 205–237. ^ Norton, Mary Beth (2002). In the Devil's Snare. New York: Vintage Books. pp. 26, 28, 48, 55, 64, 80, 140, 148, 158, 200–201, 205. Maple, Eric (December 1960). "The Witches of Canewdon". Folklore Vol 71, No 4. Norton, Mary Beth (2002). In the Devil's Snare. New York: Vintage Books. ISBN 0375706909. Murray, Margaret (1921). The Witch-Cult in Western Europe. London: Oxford University Press. Briggs, Robin (1996). Witches and Neighbors. New York: Penguin.